Rosalind Carroll said student should contact the RTB with cases. DCU students staging a sleepout in protest at rising rents in April. THE HEAD OF the Residential Tenancies Board has said that students living in private student accommodation are in many cases living in tenancies and are entitled to the legal protections afforded in this situation. RTB director Rosalind Carroll told an Oireachtas Housing Committee earlier this week that students living in accommodation who may be facing significant rent increases should contact the RTB to ensure they are legally protected as tenants. “First of all just to say we believe a lot of the student accommodation out there that’s purpose-built but within the private sector does come within our remit,” Carroll told the committee. “And I want just to make that very explicit because some of the press it isn’t and it’s really important that tenants understand that they should take the case to us. There’s a lot of cases out there where people might claim that something is a licence but the fact is it doesn’t matter what it’s named, it’s about what its substance is. Carroll and other members of the RTB were before the Committee as it scrutinises the new Residential Tenancies (Amendment) Bill. Carroll’s comments will be welcomed by students currently campaigning against significant rent hikes in their accommodation. A number of private providers of purpose-built student accommodation (PBSA) have been hiking the rents of the properties by up to 30% in some cases, to bring them in line with newer units on the market. 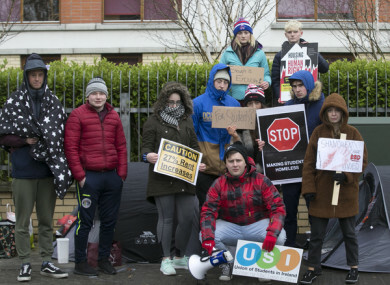 This issue was brought into sharp focus in April when a group of DCU students staged a number of protests as part of the Shanowen Shakedown campaign, combating plans by a private provider to hike rents by 27%. It was believed that unlike with normal private rental properties in certain areas, PBSA units are not subject to the rent controls that were introduced by government in late 2016. It was stated that students living in this type of accommodation were in licensee arrangements, and not traditional tenancies. This means they don’t fall under the remit of the Residential Tenancies Acts and the Residential Tenancies Board – so they couldn’t take a case to the RTB and would have far fewer rights than offered to tenants. However, Carroll’s statement this week clarifies that students in this accommodation may in fact be tenants and therefore granted all the rights afforded traditional tenants. It is believed that cases in relation to this have been taken by students to the RTB and that a final decision is being awaited. Earlier this month, Fianna Fáil and Sinn Féin housing spokespeople Darragh O’Brien and Eoin Ó Broin said they would work together to ensure the uncertainty around student accommodation rents was solved. The pair have called for the government to add a provision to its Bill which will see student accommodation rent rises capped at 4%. If the government fails to do this, both parties have said they will work together to ensure an amendment is voted in – and have issued an ultimatum of sorts to Housing Minister Eoghan Murphy and Fine Gael. Speaking this week, Rosalind Carroll said that the RTB would welcome clarity around the issue to be included in rental laws. “If a tenant has peaceful and exclusive occupation of that dwelling. Isn’t being moved from room to room on a weekly basis or on a regular basis. They’re kind of two core principles that you would look at in terms of looking at student accommodation,” she said. That doesn’t mean to say that providing clarity in the legislation would provide everybody with a bit more assurance on that. Speaking to TheJournal.ie this week, Eoin Ó Broin said that comments from the Carroll meant that the government had no reason not to bring student accommodation under the remit of the RTB in new laws. “If the RTB are saying these people are already included but they would welcome clarification, there is no argument from the minster not to include that in the legislation,” he said. Email “Students facing 27% rent hikes in accommodation should take a case to the RTB, says chief”. Feedback on “Students facing 27% rent hikes in accommodation should take a case to the RTB, says chief”.